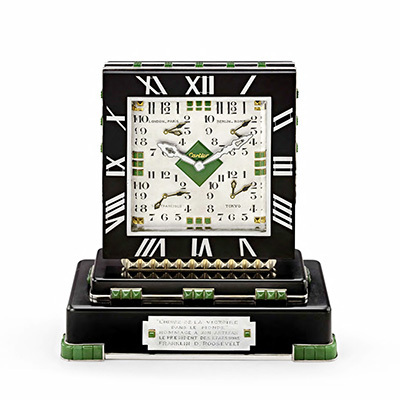 Franklin D. Roosevelt’s Cartier onyx and nephrite clock. Photo Cartier Archives, Paris © Courtesy SquareMoose, New York Inc. 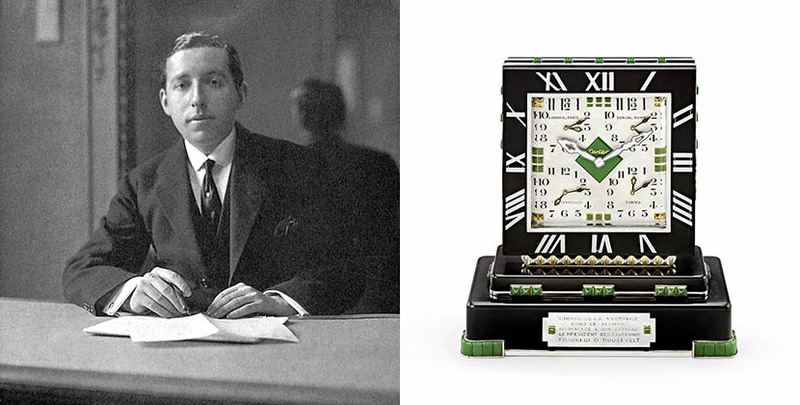 The clock was not randomly sent in December of 1943 by Cartier as a sign of support of the commander-in-chief. Pierre Cartier knew the president and had met with him several times. The French engraving on the timepiece suggests the two spoke French when they got together. President Roosevelt was fluent in the language. So why was the French jeweler meeting with an American president during wartime? It was a conference very much in keeping with Pierre Cartier’s remarkable life as a visionary deal broker in jewelry and politics. 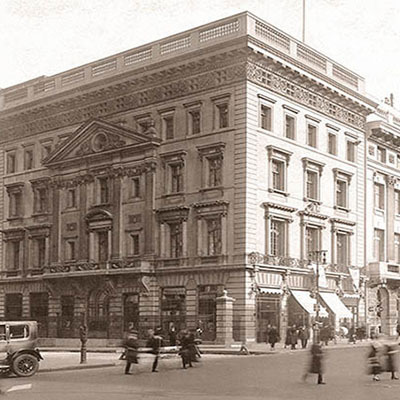 A grandson of the founder of Cartier, Pierre moved to New York City in 1909 to open a branch of the family business and set up a home with his American wife. He married an heiress from St. Louis, Missouri, Elma Rumsey, in 1908. From the day they arrived in Manhattan, Elma and Pierre were very active on the social scene. Many of their activities surrounded their shared passion for the arts. There were countless charities they supported including the L’Alliance Française, the Metropolitan Opera as well as the Brooklyn Museum. Their names appeared in the papers at least once a month, usually more often, announcing all the various events around town they attended or hosted at their Beaux-Arts Parisian style townhouse located at 15 East 96th Street. The home had 30-rooms, 11 bathrooms, 7 fireplaces, a grand marble staircase, an octagonal dining room and a ground-floor carriageway. The beautiful house still exists and has been historically landmarked. Pierre Cartier became well-known beyond New York City in 1911 with the barrage of press surrounding his sale of 44.5-carat Hope Diamond to American heiress Evelyn Walsh McLean. 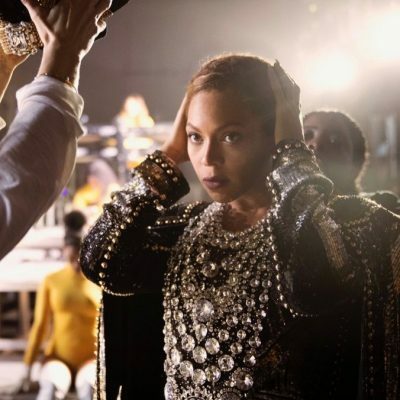 The press covered every aspect of the transaction from the McLeans consideration to the final purchase of the famous diamond that had been part of the French Crown Jewels, originally acquired by Louis XIV. While the specifics of the deal Pierre Cartier struck with Morton Plant for this Fifth Avenue Mansion was kept out of the press at the time, it is now one of the most legendary real estate stories in the world. The story goes, in 1917 Mr. Cartier gave Mr. Plant a million dollar double strand of pearls for his beautiful young wife Maisie and a $100 for the home. What was covered by the press was how beautifully the residential property was transformed into a House of Cartier. Pierre directed his architect to basically maintain the look of the stunning mansion’s façade. The largest change was to move the main entrance from 52nd Street to Fifth Avenue where there was more foot traffic. The boutique won a gold medal from the Committee of Architecture Harmony of the Fifth Avenue Association. Once the doors were open, Mr. Cartier made the mansion a destination for New Yorkers and visitors to the city. His formula for success—above and beyond the alluring environment—was a combination of amazing gems and jewels and must-see exhibitions. A couple of pieces with royal provenance Pierre sold at the mansion were pear-shape emerald and diamond pendant earrings that Napoleon gave Empress Josephine and a strand of 42-black pearls from the collection of the Russian aristocrat, Prince Youssoupoff. The historic Thiers pearl necklace from the collection of the first French president’s wife sold by the Louvre in Paris received a significant amount of press when Pierre Cartier purchased it. He put the piece on exhibit at the mansion as a fundraiser with proceeds of the $1 admission fee donated to Mrs. W. K. Vanderbilt’s cause the Big Sister movement. In 1923 Pierre Cartier used the mansion’s galleries for the first American exhibition of art deco lacquer artist Jean Dunand’s work. There is a nod to this historic show in the Cartier renovation today with the Atelier Midavaine lacquer work in the Panthère Hall. When royalty and dignitaries visited New York, there were often reports in the papers about a stop on their itineraries to visit Pierre Cartier at the mansion. Some of his guests included the Grand Duke Alexander of Russia and Maharajah of Kapurthala, the great grandfather of contemporary jeweler Hanut Singh. 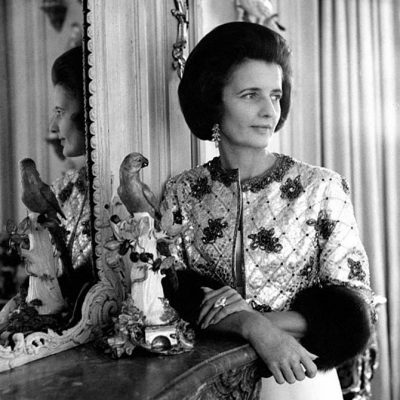 During the Queen of Romania’s 1926 jam packed tour of New York City, she spent a half-hour at the mansion. A style star of the period, the queen told Pierre how she had invented the fashion for wearing head jewels with the new bobbed hairstyles. The New York Times reported that Pierre “listened attentively” as she shared this information. In 1928 Pierre entertained French Aviators at the mansion. Each received a cigarette cases engraved inside with the continents they had transversed and their course marked in blue enamel. In addition to the activities Pierre Cartier conducted at the mansion and on the New York social circuit, there was an equal balance of commitment to any number of French political causes that changed with needs over the decades. Franklin D. Roosevelt was not the only president Pierre Cartier knew. He met with several. The first was Calvin Coolidge. Mr. Cartier made sojourns to Washington to lobby for issues as diverse as French fashion and the French economy in his role as a representative of the French Chamber of Commerce. “I have used my best efforts to promote and develop, through Franco-American organizations, the closest economic and cultural relations between the United States and France,” he once explained.“To me France and America are sister countries and they will always remain so.” Pierre Cartier placed a symbol of the alliance on the third floor façade of the mansion. It is the large bronze clock featuring an American eagle and French rooster commissioned from the Brooklyn-based sculptor R. Bonet in 1919. After the end of World War II, when Pierre Cartier retired with his wife to Lake Geneva, Switzerland he remained a respected figure in politics. During the 1955 Geneva Summit Conference, President Dwight D. Eisenhower stayed at Cartier’s home. The visit probably harkens back to the importance of Pierre Cartier’s work during World War II when he presented Roosevelt with the clock. 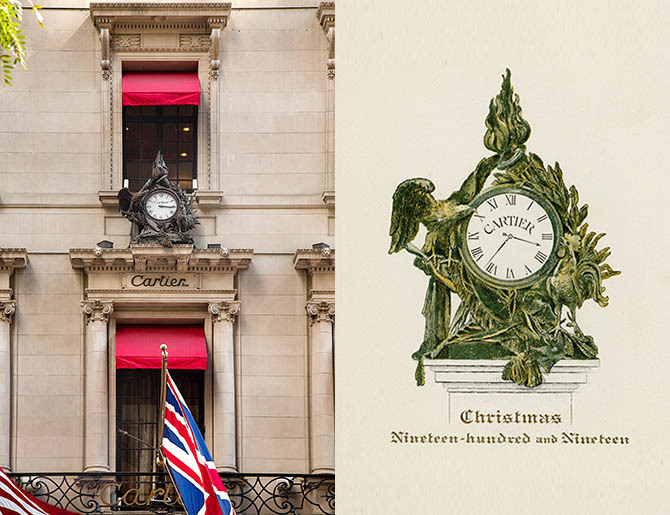 Cartier truly acted as a diplomat for France during the war. Clearly his charming demeanor and knowledge of both nations was appreciated by politicians. His official titles during the conflict included Coordinating Council of French Relief So­cieties and the jewelry division of the National Service Fund of Disabled American Veterans and treasurer of the United Committee for French Relief. When Pierre Cartier passed away on October 27, 1964 at his lakeside residence in Geneva, a memorial was held in New York at St. Patrick’s Cathedral just one block away from the Fifth Avenue Mansion where his life and work will be remembered forever.